Cheesy Mexican Casserole is a wonderful meal. It is loaded with healthy ingredients and a few that might not be too healthy. So I guess that makes a nice balance. 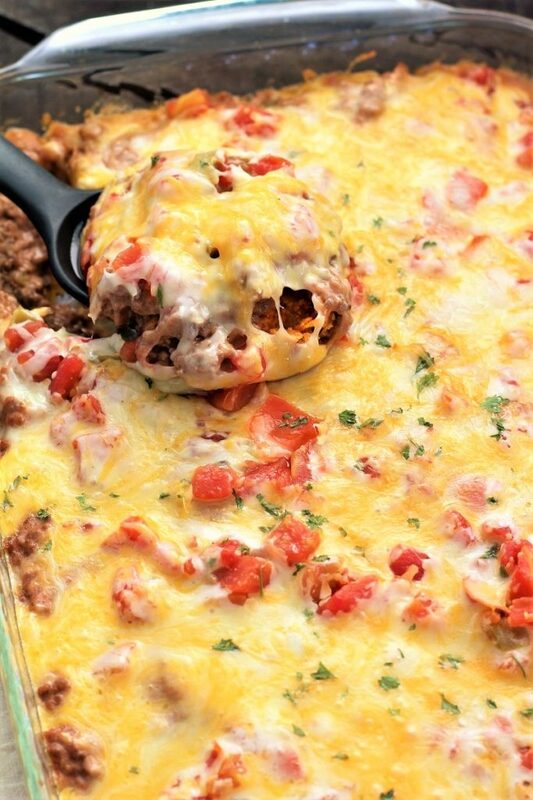 My boys like this casserole and the best part of all is that they will even make it! It is wonderful and makes up fast. That is the way to do it, find something that they like and then teach them to make it. I am pretty sure that this is the go to recipe when my married son is in charge of making dinner for him and his wife. I will say “what”s for dinner”? and he will usually say” Cheesy Mexican Casserole”. I think that that is wonderful. They have a new baby and with his wife working a few hours a week, he gets to take his turn in the kitchen. Good for him I say. Take time out today to teach your kids how to make this yummy dish. I’m pretty sure you will be glad that you did. Don’t forget, this will give you more time to play together. And there is nothing better than that. I have to remind myself of the idea of taking time to play; growing up on a farm, we didn’t do too much of that. There were cows to milk, hay to haul, and all kinds of chores. Now days, I am usually looking for some work for my kids to do. Yes there are usually dishes, but for some reason, some of them don’t love doing dishes. I think that I had better buy some cows for them to milk! That way, I am sure they would love washing dishes. Enjoy the Cheesy Mexican Casserole. Growing up on a farm, did make me appreciate the jobs that I now have. I get to work inside where the temperature stays nice and warm or cool. Also, it is a lot funner to wash dishes than it is to wash milkers. It is also a lot nicer to cut someone’s hair than it is to be hit in the face with a cows tail, especially if the tail has ice balls on the end of it. Yep that is not fun at all. I remember my face being so cold and then one of those sweet cows would swing her tail and wack, smack me in the face. I can truly say that I have been very blessed in my life, my husband has provided for me very well, and I have done a few jobs outside of the home, but not outside in the heat or cold. I am very appreciative of all that I have. And I have been enjoying getting rid of some of the extra stuff that I have that I no longer need. I love seeing the extra space around the house where there use to be a lot of things. Some of the bedrooms in my home are empty. However, I think it is time to find a extra bed, so when family and friends come to visit, there will always be enough room and everyone will feel welcome. When I was young and people came to stay at our home, I would sleep on the floor and give up my bedroom, no questions asked. So I have had my kids do the same thing. They might complain a little, but I tell them that they better get over it mighty fast. I also know that some people do not like when people come to their home and spend the night. I think it is great, and sometimes I even fix them breakfast or dinner. Cheesy Mexican Casserole is a great meal for when people are coming to spend the evening. It works up fairly quickly and it goes a long way. 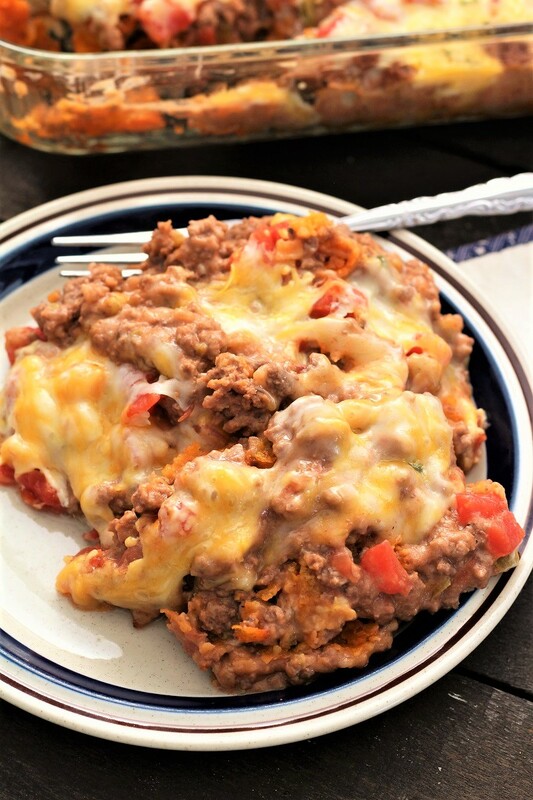 1- This Cheesy Mexican Casserole can be made ahead of time and then put in the refrigerator, but if you do, make sure and give it about 10 extra minutes, as it will take extra time to get up to temperature. 2- You can use just one kind of cheese like Cheddar, if you do not want to use more than one kind. 3- I also like to cook hamburger ahead of time and put it in a baggie in the freezer. This helps make this dish come together a little quicker. Brown ground beef, onion and garlic in a large skillet; drain well. Add beans, soup, tomato sauce, and green chilies, stir together and set this aside. In a 9 " X 13" greased pan, cover bottom with one layer of crushed chips. Add several large spoonfuls of bean and hamburger mixture, then sprinkle with cheese (both kinds). Continue layering in same way one more time; making two layers. If desired, top with one can tomatoes with green chilies. spreading to cover.